National Endowment for the ARTS (NEA) Chairman Jane Chu announced the award of a $150,000 “Our Town” program grant to the Shreveport Regional Arts Council (SRAC). The award is one of 60 such awards totaling $4.1 million supporting the celebration of arts in local communities across the nation. SRAC will match the grant with funds from the city of Shreveport and support from area foundations and corporations. Council. 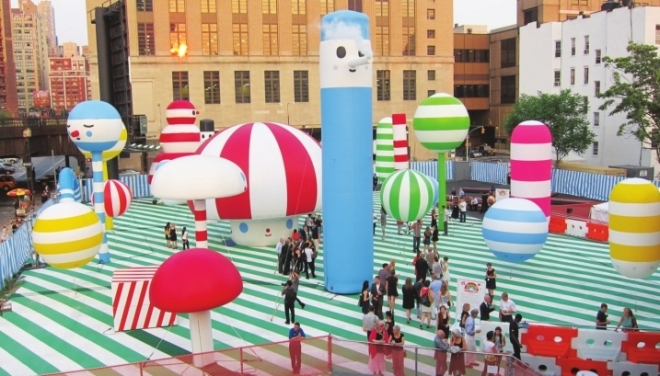 “The culmination of these projects includes a block-long installation of inflated colorful characters in the Shreveport Common neighborhood to spread the ‘FriendsWithYou’ positive message of Magic, Luck and Friendship,” added Atchison. Friends With You is the fine art collaborative of Borkson and Sandoval, creators of inflatable installations that have appeared around the world and in the new Netflix series, “True and the Rainbow Kingdom.” Working collectively since 2002, these artists are known for immersive installations created with a variety of mediums including painting, sculpture, large-scale experiential installations, live performances, virtual reality and animation. Their reductive and simplified use of geometric abstraction always contains a whimsical touch. “This is a perfect arts and city-led revitalization project for Shreveport Common, the historic yet long-blighted nineblock area at the west edge of downtown Shreveport and eastern Ledbetter Heights/ HUD Choice Neighborhoods,” said Wendy Benscoter, Shreveport Common executive director. “Borkson and Sandoval’s work invites viewers to reconnect with neighbors and friends of Shreveport Common to share community experiences that promote the FriendsWithYou mission of Magic, Luck and Friendship,” added Benscoter. The Shreveport Regional Arts Council and FriendsWithYou will kick off this series of five projects funded by the NEA and the city of Shreveport in January 2019 in Shreveport Common. The community will be invited to participate in various ways including the creation of “character” balloons to include in the parade, school tours, educational outreach and more. Visit shrevearts.org for more information and to watch for additional programming as this project develops.